during the years i was a member of islay pipe band, our weekly practice session was held in a local college on a tuesday evening. as you can perhaps imagine, for a pipe band to perform well, it is necessary for the majority, if not all, members to attend regularly in order that any musical anomalies or tuning difficulties be ironed out. unfortunately, due to the all encompassing nature of televised football (soccer), invariably there was a live broadcast scheduled at least every second tuesday eve. the football fans amongst the band (and there were more than just a few) would be conspicuous by their absence on those evenings. as one used to cycle stage races taking place over the course of several weekdays, when the conscientious are slaving over a hot imac, i found it hard to reason why it would not be possible for the footballers to simply watch the edited highlights when band practice was over and done with. but i was informed, in no uncertain terms, that doing so was complete anathema. 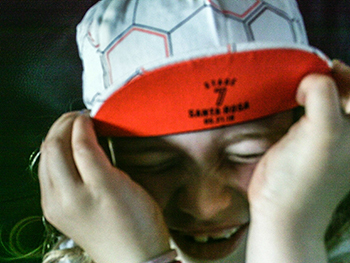 if a live match was on tv, it had to be viewed as it happened in case someone let slip the final result before the highlights were broadcast. 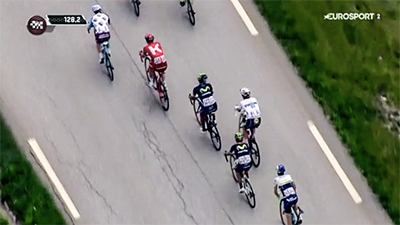 though i cannot deny that during certain stages of the recent giro d'italia i had my ipod tuned to eurosportplayer and sat 'neath the imac screen, i'm usually quite happy to watch the highlights of a weekday or weekend evening. 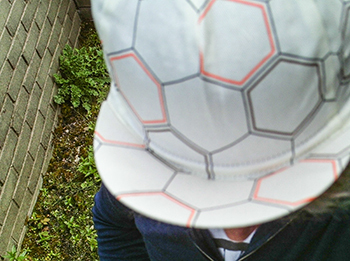 without the self-styled #homeofcycling, our still niche corner of the sporting world would be frighteningly sparse. true, when the spring classics are in full flow, there's always sporza, but it's becoming harder and harder to find a non-geo-restricted internet feed and eurosport generally only features the bigger races on the calendar. when it comes to the tour de france, we at least have messrs. boulting, imlach and boardman on itv four to offer salvation from eurosport's idiosyncratic shceduling, let down purely by their insistence on employing the services of liggett and sherwen to provide commentary. but you can't have everything. the giro d'italia, however, seems to have remained the preserve of eurosport, though i believe i do recall ned and david millar offering an alternative last year (i could be wrong about that). so in a race that suddenly came alive during friday's mountainous stage when the hapless kruijswick in the pink jersey came a cropper into an impressively deep roadside snowbank, allowing orica's chaves to ride into pink, closely followed by nibali and valverde, anticipation of saturday's stage was undoubtedly high. more mountains on saturday were, not unnaturally, expected to make the final selection for sunday's procession into milan. as it turned out, that's precisely what transpired, with nibali who, at one time looked as if he wouldn't even feature on the final podium, attacking, distancing both valverde and chaves and riding into a very late pink jersey to take the ultimate victory. saturday in the hebrides was quite magnificent, with wall to wall sunshine and blue sky, offering the first opportunity this year to ride in short sleeves with no armwarmers and bibshorts with no kneewarmers. happy as i am to watch edited highlights rather than miss the chance to 'get the miles in' as the mighty dave t would say, i checked the #homeofcycling's tv schedule for the evening and sat down at 7:30pm to watch what surely ought to be the pinnacle of italian stage racing. except, as many of you will be aware, the french open tennis tournament from roland garros is also underway and the match televised prior to the broadcast time for the giro had drawn at four sets each. despite several other individual eurosportplayer channels being devoted to tennis, the broadcaster elected to remain with the tennis and show the final set. this finished just after 8pm, but rather than depart immediately to the giro highlights, eurosport decided to extend their tennis coverage by offering a round-up of results from the day's play at roland garros before popping into yet another round of advertisements. lest you think i protest too much, might i remind you that they still offered several other channels featuring any number of tennis matches. and they had live athletics scheduled for 9pm. 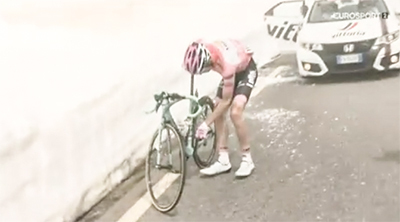 so, at approximately 8:15pm, we went over to rob hatch and sean kelly for the giro highlights, a situation that promised well as the coverage commenced with 118km of racing left to the finish. however, after an inevitable advertising break before 8:30pm, they returned to the race with eventual stage winner reine taarame only 1.7km from the finish line. it transpired that nibali had attacked earlier in the stage and had ridden his way into the virtual pink jersey on the road, a fact confirmed by the time gap between himself and chaves on the finish line. as someobody other than me commented on twitter "#homeofcycling my arse. subscription cancelled". though i can understand the vagaries of trying hard to please everyone, coupled with the idiosyncracies of televising live sport, i am very much of the opinion that if you set a tv schedule, you really ought to stick to it. and if you're going to mess about with cycling fans in this manner, then you really ought to consider your overuse of the hashtag #homeofcycling. you may garner that i was not best pleased and the appearance well after the fact of lengthier coverage by way of an on-demand video really did little to ameliorate the situation. thankfully, for the myriad of cycling fans the world over, i am not in a position to influence cycling coverage on tv or online, but considering the importance of the stage in question, i think eurosport owe their cycling subscribers a full apology. it often seems that they are the #homeofcycling only when it suits them to be. there's a scene in an episode of the big bang theory where penny's ignoramus of a boyfriend, zac, says "that's what i love about science; there are no right answers. ", a statement that only raises the sense of glee on behalf of the 'science guys sitting in sheldon's apartment. you can see their point, as the majority of scientific discovery has to be verified, often more than once, before it becomes scientific fact. at which point it has become the right answer. as an example, witness the extraordinary amount of euros spent on the large hadron collider in order that the existence of the higgs boson might be confirmed. granted, those millions of euros were not purely to make peter higgs a science hero, but you get my drift. however, there are areas of so-called science in which there truthfully are no right answers, though there are most definitely one or two wrong ones. in this respect, i'm specifically thinking of ergonomics and anatomics, perhaps not sciences in the true meaning of the word, but often treated as if they were. in fact at least one definition of the word ergonomic mentions it to be a scientific discipline in that it relates to the interaction between humans and the elements of a system. 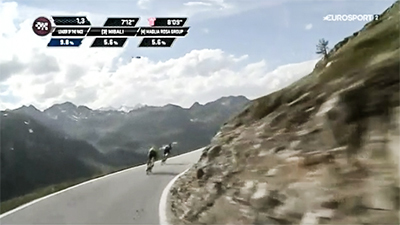 humans are, almost by definition, as different as the gradients experienced on the various mountain stages of the giro d'italia. thus what might be seen as ergonomically correct for yours truly would be almost bound to be considerably less so for those of you reading this article, particularly if you're even a few inches taller or smaller than am i. thus, even if scientific principles are applied, the answers are likely to vary quite considerably. 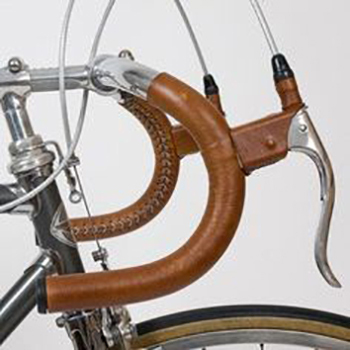 perhaps one of the most obvious examples of this in velocipedinal terms are the seemingly endless variations in handlebar design. 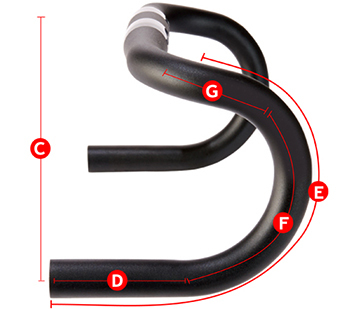 with varying widths, curves, depths and diameter of tubing (alloy or carbon), there are more than just a few parameters available for tweaking by handlebar designers (always assuming such a job title exists in the first place). personally, i place great faith in what i believe is termed the classic bend, bars that curve from top to bottom as if they were half a circle, flattening out at the bottom to allow a simple, yet effective grip when in the drops. however, in recent years, the very shape that was apparently good enough for eddy has been usurped by the so-called anatomic bend, one that pays specific attention to the science of ergonomics. this offers what might reasonably termed a parabolic curve; a scientific principle if ever there was one, but one i fear might not offer the benefits it claims. on the road from craighouse on jura to the ferry ramp at feolin, the last couple of kilometres are substantially downhill. prior to the surface being repaired a few years ago, this section featured patches of gravelly tarmac and frequent influxes of random sheep. the safest way to descend was often to feather the brakes continuously until level ground was reached en-route to the ferry. riding a review bike at the time fitted with anatomic bars, it wasn't until the following morning that i had to query why my thumbs were quite so painful. though it may be different for others, the sweep of the bars as they curve, pulls them consistently further away from the brake levers, meaning it's a bit of a stretch between thumb and forefinger to reach the brake levers. 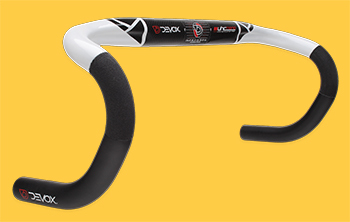 though it may be thought that this parabolic curve offers a better and arguably more comfortable grip in the drops, i have serious misgivings over whether the anatomic bars were designed by a cyclist. i can't help thinking there might have been a computer or two involved along the way. 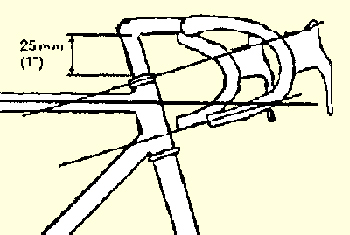 so, in the light of there being 'no right answer', though i've not made up my mind regarding the ideal bar width, if the classic bend was good enough for fausto, jacques and eddy, it's the right answer for me. and perhaps yours too. i started wearing prescription spectacles while in first year at secondary school. or, to be more accurate, i owned my first pair of prescription glasses when i was still in first year; it was year three before i actually wore them at school. this was entirely down to the fear that a certain faction of my classmates would trundle out the usual four-eyes, speccy and other derogatory nicknames were i to be seen wearing my spectacles in class. in retrospect, this may have been a touch of paranoia, since i'm not entirely sure i was of any great significance that would have had them notice in the first place. however, the fact that i am short-sighted (myopia), meant that reading text books etc. was never any problem, a situation that has remained so to this day. however, seeing anything written on the blackboard (yes, it was that long ago) was gradually becoming something far harder to do. granted, finding a seat at the front of the class was never a problem; the majority of my classmates would have done anything rather than sit within sight of the teacher. 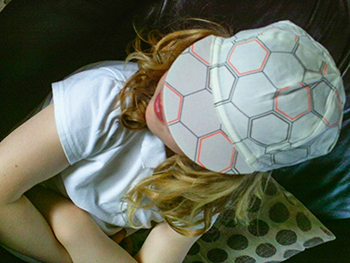 this meant that i could just about get away with concealing the myopia for longer than i'd expected. but once it came to third year, i had sufficient confidence and insufficient vision to bring the specs from their case and onto the bridge of my nose with greater and urgent frequency. i was relieved to note that no-one seemed to care much. 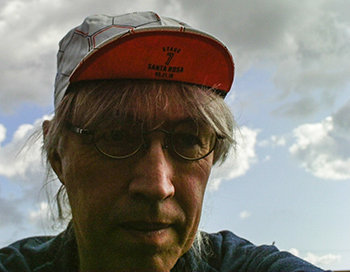 in june 2007, in anticipation of riding in french france under a blazing hot and inestimably bright sun, i purchased a pair of rudy project cycling glasses featuring a pair of prescription inserts that sat behind the mirrored lenses. i still have those to this day. disappointingly, france was apparently unaware of my defensive purchase and the three days of riding to the heart of the country remained stubbornly overcast and, on the final day, just a tad on the wet side. however, now that i owned such eyewear that would offer the very image of speed and professionalism that had been hitherto concealed behind ordinary glasses, the rudys were worn on every pedalling occasion, if only because my eyes seem particularly susceptible to bright light. and because they made me look faster (a guy can dream can't he?). however, good though they are/were, every bit as good as their same brand replacements of only a few years ago, there seemed a great danger that wearing them in civilian life would be tantamount to being mistaken for a triathlete. i'm sure you can imagine the potential shame of such an error. thus, though the west coast of scotland is scarcely renowned for endless days of sunshine, even on such rare occasions, i was condemned to suffer the brightness of the short-sighted cyclist. that was, however, until rapha released their classic sunglasses last year. 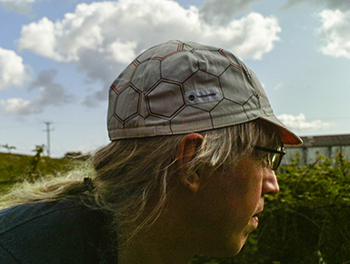 a smidgeon less 'racy' in appearance, yet every bit as practical for the intrepid cyclist, with a pair of tinted prescription lenses installed, i could wander the streets of bowmore with impunity, without so much as anyone casting aspersions towards my swimming or running prowess (or lack thereof). the only perceived downside, and it was a somewhat expensive downside was dispensing with the carl zeiss lenses that arrived with the classic glasses and ordering prescription replacements. that is all history as of yesterday, when rapha introduced the classic ii, 20% smaller in size to suit a wider range of riders, with slightly elongated legs to help them remain in situ for those of you in the habit of plugging them into the vents on the front or rear of your helmet when the sun goes away. and there's new colours too. but the real boon, for those of us in need of a prescription, is the opportunity to purchase the classic ii with clear demo lenses, ready to hand to your optician. the frames of the newbies are still made from the same cotton-based acetate by italy's mazzucchelli ensuring that the 20% reduction does not apply to their style. i am most definitely not the prime example of one taking exhaustive care of a pre-event training. as an example that will have you cross the street rather than be associated with me in any way, almost laughable circumstances have had me spend most of the winter months riding bicycles bereft of bottle cages. review bicycles rarely arrive with these containers already affixed to the downtube and the bicycle wearing the very one i wished to transfer for the periods of review were simply too far back in the bikeshed to enable retrieval. however, in my defence, long since has been the day when i have not popped out for a few score of kilometres and returned with the bottle as full of water as when i departed the croft. i am well aware of the numerous publications and bona-fide trainers that will be aghast at my insolence, but i am not in the habit of drinking a great deal at the best of times. nor, indeed, do i appear to perspire a great deal either, so perhaps one is comfortably balancing the other? at any rate, this is not advice i would cheerfully pass onto another; i do not condone my own behaviour and i'd far rather that you pay attention to the professionals' advice in place of any i might offer. unless, of course, i have inside information not of my origination that i might wish to pass on for your benefit. i truthfully was not paying attention when the on-screen statistics were being broadcast during last year's prudential ride london, but i do seem to recall there were more than just a handful of willing participants. and unlike televised marathon runs, there seemed to be quite a few with broad grins upon their faces (though that could just have been for the cameras). while there is a veritable cornucopia of events comprising the weekend's cycling festivities, those principally in the headlights are likely to be the 46 mile ride and the hundred, though by the time you read this, entries for both are likely to have closed. if you've already paid your entry fee and have a startline position guaranteed, several of you may be wondering just what you've let yourselves in for. having not once participated, nor in fact considered the option of so doing, i would be the very last person to offer or be asked for advice regarding the purgatory that may or may not await. 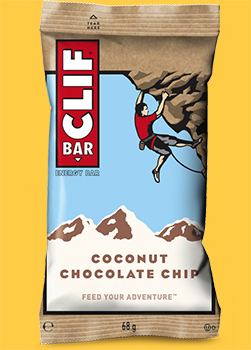 however, as official nutrition partners for the event, the folks at clif-bar would seem the very people with a handle on a means of hand-crafted survival. in fact, i have in my possession a short publication entitled 'every day builds toward race day' providing not only salient training and nutritional advice to help with your designs on glory, but useful schedules that might be implemented in the weeks leading up to 31 july. i cannot deny that the seven pages of training information would fill me with more dread than the event itself, but for that very reason, i'd be the guy for whom the coastguards were still searching more than two days after the ride had finished, probably due to malnutrition and physical attrition. having allegedly signed upfor the 2017 hot chillee londres-paris, i will undoubtedly be forced to eat my words sooner rather than later, though if taken with a clif bar peanut butter bar, i should be both humbled and fortified at the same time. it may be that the folks at clif-bar have provided each and every entrant with the training guide and selection of protein, carbo and hydrational goodies that i have at my beck and call, in which case, might i suggest that you read every last word in the training guide? there is nothing more foolish than a cyclist provided with every necessary detail who proceeds to ignore the advice of his betters. ignorance may not kill you, but embarrassment will undoubtedly be your bedfellow. on the off-chance that i am incorrect regarding the dispersal of such training and nutritional guidance, might i suggest that you contact the good people at clif-bar to ask nicely if they wouldn't mind sending you a copy. though doubtless i come across as a worldy wise traveller of the globe, accustomed to laying my head in a different country each night, the truth is far more mundane. the many-bedroomed mansion in the country, security guards and cctv that exists between you and me is merely a construct to hide the inescapable fact that i am far more down to earth than evinced by my more usual public persona. this is perhaps no better characterised than by pointing out that mrs washingmachinepost and i began married life honeymooning in portinscale in the lake district. though a solitary bicycle was as much a part of our family as the carrier bags employed to take the shopping home each week, you may infer from the word solitary, that only one of us had made inroads to the velocipedinal life. thus our humble beginnings on the northwest region of englandshire were, dare i say it, observed from the front seats of a motor car. it will be of no interest to you whatsoever that said motor car suffered greatly from a lack of oil in the gearbox during the homeward journey, heralding a remarkably accurate rendition of ball bearings playing in a washing machine. if only i could have seen that as a foretelling of things to come in the blogosphere (a term i abhor, but couldn't think of a viable alternative). 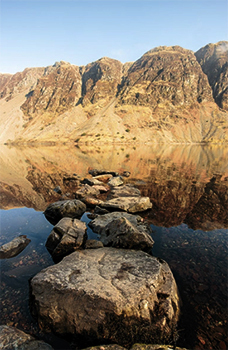 from the point of view of having an excuse ready at every turn, our lake district meanderings took place some considerable number of years prior to mr barrett penning his excellent guide to the roadways that inhabit this endearing portion of country south of the border. this way i have no need of apologising for not having a copy accompany us during the nuptial aftermath. 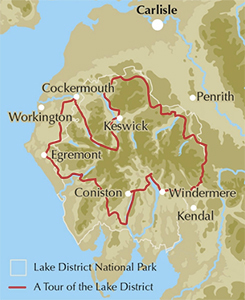 of course, more recently and for a considerable number of years, we have holidayed near penrith, but that would invite a whole enchilada of alternative excuses. disappointingly, mr barrett seems to have been carefully intent on ensuring portinscale, only a matter of stones throws from the town of keswick, feature not on any of his intriguing days out on the bicycle. though he does point out that "Some have very steep gradients and cross the highest passes in England...", those exist purely for the masochistic pleasure of those who see the defiance of gravity as the colour of joy. 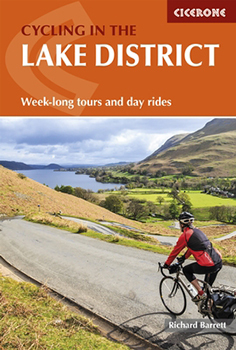 in his introduction to the book and to the lake district itself, he features a seven-day touring schedule, but also advises that the intrepid rider might like to follow the route of the annual fred whitton challenge sportive ride. though as he records "Winners usually complete the course in less than six hours...", there's not a lot of sightseeing or coffee stops included in such alacrity. thus he has thoughtfully diced the fred whitton into manageable chunks encompassing two, three or five-day challenges depending on your ability of predilection for a relaxed daily mileage. other than this, however, there are a wide variety of rides that can easily be accomplished between breakfast and dinner, each accompanied by a well-illustrated map, points of interest and pedal-stroke-by-pedal-stroke directions. nor would it be a cicerone guide were it not to contain information pertaining to weather, getting there, topographical information and impressive photography. each day ride is headed by the necessary map references, distance, grading as to perceived difficulty, average time for completion and, most importantly, cafés and pubs along the way. 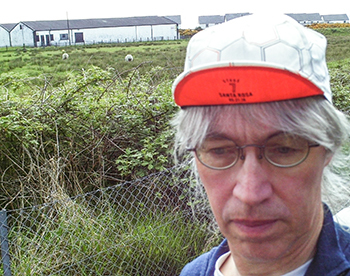 notably enough, the author, a man renowned in the world of long-distance cycling, is also the chap responsible for the recently reviewed cycling in the hebrides also published by cicerone. and far from being domiciled in the region, he resides in the more unruly weather of the outer hebrides. 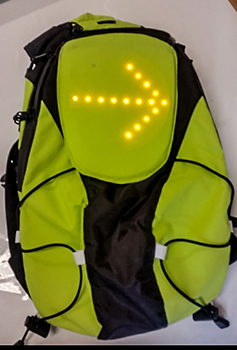 it's worth noting that, even if your interest in the lake district extends only as far as participation in the fred whitton challenge, this would be the ideal volume to pack in one of those rear pockets (yes, it does fit) to aid your sub six-hour participation. 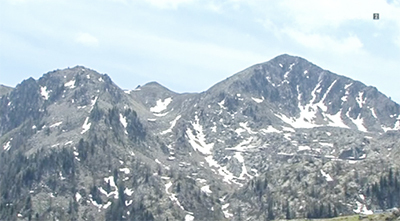 "...you will undoubtedly get wet and experience blustery days. So be prepared for them." this graphic design and cycle blogging thing is not necessarily the laid-back, walk in the park you might think it to be. in fact, it's the very notion that it definitely isn't a 'walk in the park' that is the nature of the problem. i attended art college in the 1970s (yes, i'm that old) at which time, graphic design consisted of sitting at a desk with drawing board, tubes of gouache, rotring pens and all other manner of paraphernalia to convince the average student that not only was headway being made, but it was bound eventually to lead to a graphic design epiphany. sadly, the reality was very far from this prognostication. however, though the occasional visit might have been made to the college library for so-called inspiration, the remainder of the day was spent on a not particularly comfortable stool. in the region of ergonomics, it's arguable whether anything much has improved in the interim. granted, the stool has gone to be replaced by a comfy chair, but the advent of the apple macintosh computer has delivered an activity that languishes in an almost total absence of activity. i know of no olympic athletes who have trained by pushing their forefinger around a track pad all day, interspersed with the occasional stab at a keyboard. i daresay there are graphic designers or bloggers who espouse the very greek ideal of the athlete, but they sure didn't get that way in pursuit of their career. as age creeps up silently and all but unannounced, the fact that i had minor aches and pains where once there had been flexibility and strength, led to the realisation that, like many office bound creatures of habit, my posture in front of a computer screen often left a great deal to be desired. in fact, were my current spate of pixel wrangling to be the subject of a webcast, you would note a greater similarity to quasimodo than to alejandro valverde. the worrying part is knowing all this, yet failing to implement any remedial action. it was not, however, always thus. having taken account of my almost permanently seated position, one that was highly unlikely to evolve for the better as my career progressed, i started taking a greater interest in the ergonomics of the chair in which i sat. the devices euphemistically referred to in catalogues as computer chairs have simply become a generic representation of what some marketing department thought to be a wizard wheeze. in point of fact very few, if any, offer much in the way of comfort and most would have to look up the definition of lumbar support. not wishing to end up as a crooked figure unable to sit astride any bicycle released from the bike shed, i searched far and wide for a chair that might conceivably prevent this happening. several of you will already be aware of possibly the singular answer to this question and may even be fortunate enough to be sitting in it as you read these very pixels. but for all others who begin to recognise their stature as similar to that of yours truly, the answer to our prayers would appear to be the herman miller aeron chair. unfortunately, this comfort and joy has a retail price tage that would seem of only minor debate to those with a phalanx of very expensive italian carbon fibre in the bike shed. undeterred, i was happy to discover that there are office furniture outlets happy to purvey reconditioned aeron chairs and i had it in mind perhaps to persuade my employers that cashing in a premium bond or two in my favour might be an excellent idea. they did not see this apparent opportunity in quite the same light, undermining my intention of simply purchasing one from my own pocket money by supplying a chair that bore a few of the gratifying hallmarks of the herman miller chair, yet ultimately fell short where most required. so, a bit like that unrequited desire to own a 1974 steel colnago master with pantographed chainset, i am still without my herman miller aeron chair originally designed in 1994 by don chadwick and bill stumpf. it would, of course, be thoroughly unfair of me to paraphrase the t-shirt slogan proclaiming "the wife went to lanzarote and all i got was this lousy t-shirt", by equating my lack of an aeron chair with the most recently promoted casquette headwear from rapha. for though my perception of herman miller the company (as opposed to herman millar, the father-in-law who loaned d j de pree enough money to purchase the michigan star furniture company in 1923) is coloured entirely by a desire for the finest chair in the world, they do actually have other strings to their bow. miller's creative adviser, ben watson was recruited to refocus an allegedly wayward business, as a result of which he established ten principles by which their collective commercial ouput would abide. one of these stated "our designs should be useful and beautiful." an edict tinged with subjectivity, but one which appears to have stood them in good stead. a retrospective exhibition of the iconic eames designs from the house of miller was held last year at the barbican arts centre in london, during which time rapha's head of design, alex valdman, was able to persuade watson to enter a collaboration with imperial works, the first result of which was a strikingly original, yet obviously retro series of casquette designs featuring daily turnaround during the recent tour of california. i have hesitated to ask mr valdman whether his office plays home to an aeron chair, but purely on the grounds of the envy it would generate if he answered 'yes'. though the fruits of this collaboration may have sold out in pretty short order, currently rapha's website features a single 1958 design by alexander girard to commemorate a stage of the women's tour of california. if you too have failed to plant your bum on an aeron, this might just keep the acquisitory flame alive a wee bit longer. 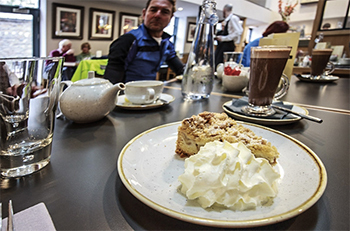 having enjoyed the company of a mobile conversation more commonly known as the sunday ride, followed by at the very least, a cup of froth and possibly a sliver of cake at debbie's, there is little by way of a following option but to head for home. no doubt the grass needs hoovered or, even worse, strimmed, or maybe i could wangle the afternoon in front of eurosport player and the giro. but prior to any of that stuff, there's the necessity of replacing all those exerted calories by way of a leisurely luncheon. naturally enough, though the business of the morning may have transpired, there's still the cycle home, the penultimate turns of which take me up the hill that is bowmore main street. the crossroads half-way to the famous round church allow me the luxury of turning right before the gradient steepens ever so slightly and i can head towards mrs washingmachinepost, home and lunch. the correct procedure for turning right is to signal my intention to turn prior to moving into the centre of the road, then repeating that signal briefly just before the turn. this latter manoeuvre is the tricky one; many of you will recognise the co-ordinated balance required to quickly signal and replace the right hand on the bars before turning. i can think of few particular reasons to ride up the centre of bowmore main street unless i had designs on turning right at the crossroads, yet on two occasions i have been close to being splattered as cars have attempted to overtake me just as i turned the front wheel. it's a dilemma that must face pretty much every cyclist on the planet. should any vehicles turn into main street from shore street after i have signalled my vectored intentions - which i'm assuming was the cause of the near-miss occasions outlined above - they would not have seen the hand-signal. the short distance and gradient both combine to minimise the time my right arm can be flailing wildly in the wind. 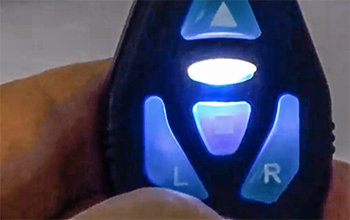 what is needed is probably some sort of obviously visual indication that would augment my hand-signals even when both hands are on the handlebars. i'd be the first to point out that such a quest has been the subject of continued ministrations by many a well-meaning individual. 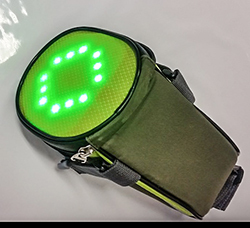 yet, on the basis that the perfect solution may not yet have arrived, the tidily named cyndicate, brainchild of guy lester consists of a handlebar mounted unit and directional indicators that fits to the bicycle or a rucksack. 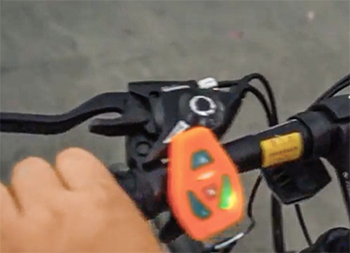 it's a wireless system, so fitting appears to be pretty much faff free and any indications will continue after both hands are back on the bars. cyndicate is quite possibly not the device you'd fit to the pinarello dogma or your katusha team kit, but in traffic, it has the potential to be one of those things that probably ought to have been in use many years ago. naturally enough, bringing this to market requires cash as well as willpower and mr lester is seeking funding pledges via the voom crowdfunding website.